45-years and a quarter of a million miles ago, mankind first stepped foot on another world. This July, Earth will celebrate the 45th Anniversary of Neil Armstrong’s first step on the moon, Apollo’s most celebrated moment. We, the United States of America, had won a very real race to show which country could first land men on the Moon and return them safely to Earth. This amazing achievement demonstrated the collective will and capability of over 400,000 American men and women doing their jobs with care and precision. Neil Armstrong’s footprint on the Moon will serve as an eternal testament to the can-do ability of mankind. Unfortunately, there are no good photographs of this moment and although the black-and-white television image was not very good for that first moonwalk, the soundtrack is still very clear. 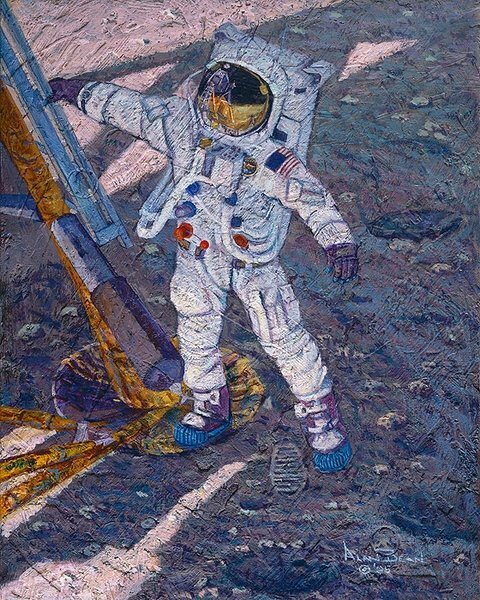 "The First Human Footprint," astronaut and moonwalker Alan Bean’s companion piece to "A Giant Leap," was created with an insight and access to the Apollo program that only a fellow moonwalker could have. “I talked with Neil for quite a while before I started this painting. I wanted to know which rung he was holding with his right hand as he stepped off the ladder with his left foot and how far around the landing pad was his right foot? He remembered most things but we agreed there were some details we just couldn’t remember from our missions. As the centuries unfold, there will be other first footprints in our future―first on Mars, on an asteroid, on a moon of Jupiter and on a planet around a different star. They will be much farther away than our Moon but none will ever be a more giant leap for humankind than the one made by Neil Armstrong and all the people who helped him make that leap on July 21, 1969.